The rugged and versatile Little Giant Cast Iron Pedestal Sump Pump will easily meet your average water removal needs. The tall, extended design and adjustable float switch ensure long lasting and reliable service and proper use. Place this unit in a 13" diameter or larger sump basin, and use the 7.5' long cord to plug the item into a standard 115 volt outlet. The cast iron body forms a sturdy, corrosion and rust resistant piece, and its pedestal design handily supports the motor at the top. The automatic float with a switch allows the item to run only when your sump basin is full, and the item can even pass up to 1/2" spherical solids. The 1/3 horsepower motor and bearings, as well as the automatic switch, are ideal for home water removal needs. The pedestal shape is formed to fit in most residential sump pits, and the outlet accepts 1 1/4" MNPT fittings. 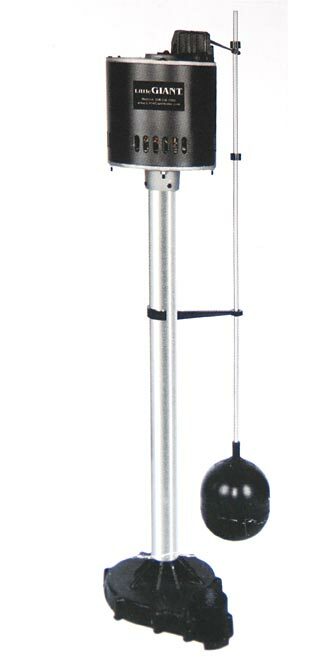 Keep your basement or sump pit free of excess water with this Cast Iron Pedestal Sump Pump. Three year limited warranty. Use this chart to determine the proper size pump for your sump pit. The height difference between the surface of the water level in the basin and the final discharge is called the Head Height. Gallons per Hour (GPH) represents the maximum amount of water your pump is capable of pushing at a given Head Height. To ensure the pump's best possible performance, reduce frictional losses by using the largest diameter hose possible.